Sue Harris developed a theme of ‘natural simplicity to reflect the individual uniqueness’ of her ‘down to earth’ farming couple. The predominant colour of her piece is white ‘to reflect the sanctity of marriage’. She created a tatami mat out of steel grass and wove it through her design to signify ‘the journey of marriage with its twists and turns, ups and downs’ and that ‘the bride and groom are always tied together during this journey’. 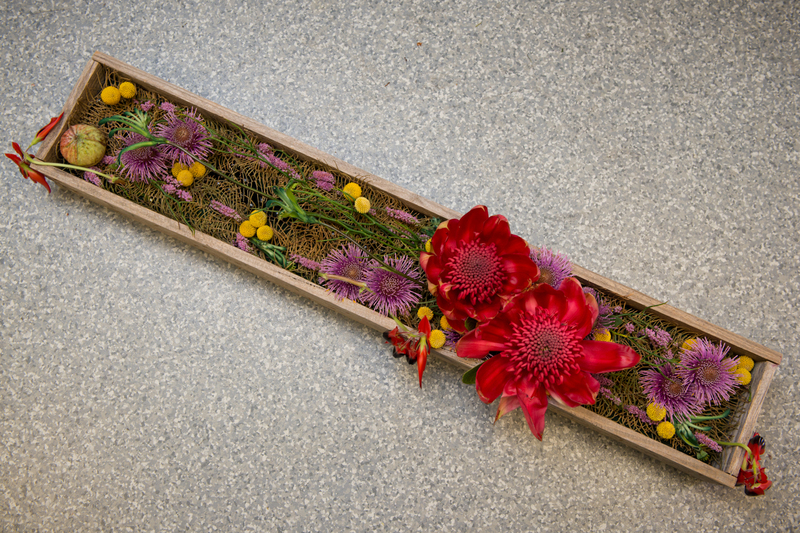 She used everlasting daisies to symbolise that marriage is forever, and sprays of Eucalyptus tetragona nuts to convey ‘sweet honey offering a host of medicinal qualities within that hard nut appearance’. 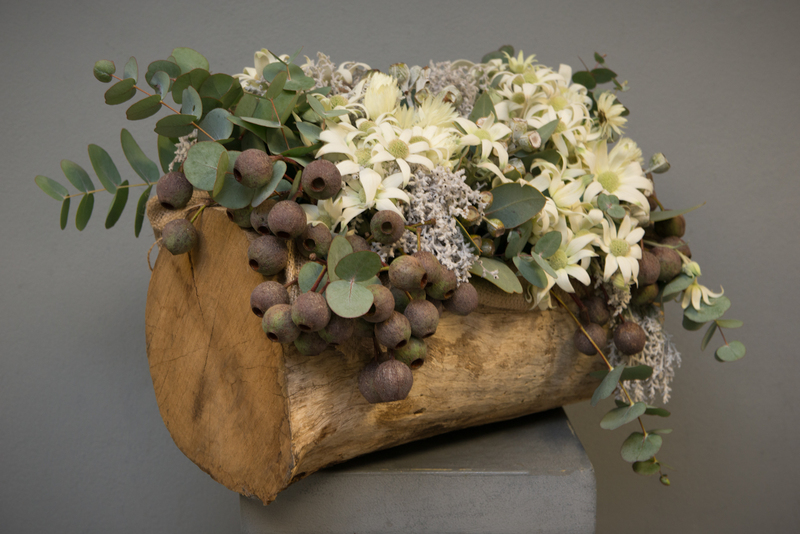 The beautiful grey gum log base was chosen to symbolise that ‘you can find beauty at any age’. Leigh Squire created a design for the wedding of Bruce, a cattle farmer to Sheila, a bride from a sheep farming family. The groom ‘treats his bride like a princess and wanted their wedding centrepiece to reflect how special she is’, she says in her design notes. The base of the arrangement is a beautiful carved bowl made by an aboriginal craftsman in the Northern Territory, a link in Leigh’s story to Sheila’s heritage. 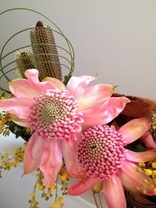 The focal flowers are pink waratahs, commemorating that the bride and groom hail from NSW (where waratah in the state floral emblem). Leigh chose the less common pink selection for its beautiful contrast with the wooden base and to link with her story that pink waratahs are rare and special, ‘just like Sheila is to Bruce’. Silvery Banksia plagiocarpa flowers, sprays of delicate wattle and beautiful eucalypt buds and foliage, and loops of steel grass complete the work. Michael Cordeiro created a contemporary design, inspired by elements of Australian culture both Western and Indigenous, wanting to highlight the importance of farmers in modern society. His back story is the marriage of an Australian farmer in his early 30’s to his bride who is a well known indigenous painter and artist. He has filled a simple rustic wooden box with red highlights (waratahs and Sturt’s desert pea flowers), touches of mauve (Isopogon) and yellow (billy buttons), and green kangaroo paw nestled on a bed of fern leaves. Jocelyn Hitchcock was inspired by the ‘abundance of wild overgrown shrubbery in the bush, with its unique variety of seedlings, delicate flowers, and stunning foliage’ and the ‘beautiful structured gardens of farms’. 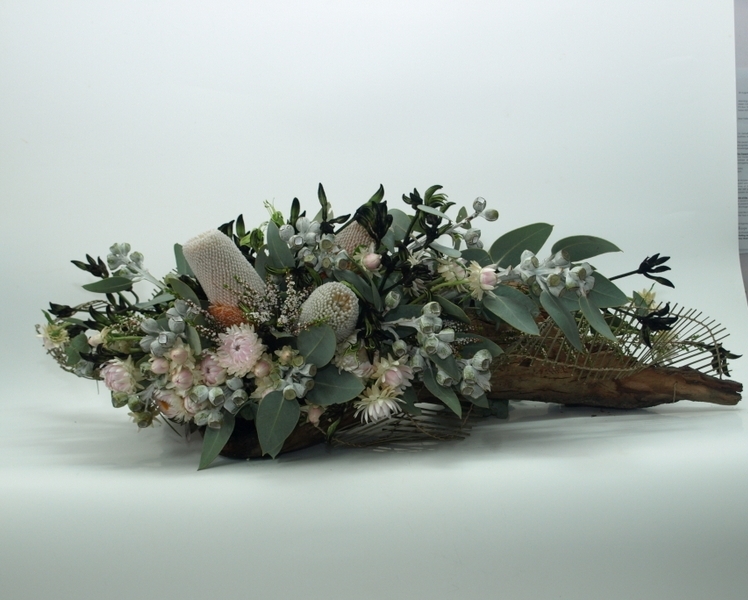 A gum log ‘overflows with a combination of white Australian native flowers and blue grey foliage, simple and subtle colours to create a natural style for a beautiful white farmer’s wedding. The Flannel flower, with such a definite shape and the petals of bright whites move throughout the piece. Gumnuts overhang on the edges, and a hint of the creamy white paper daisies add texture and colour to the arrangement. The defined shape of the tetra nuts create solid areas and form movement and depth. The smoke bush and the eucalyptus scattered throughout bring the forms, shapes, textures and colours together creating a beautiful, rustic statement table piece’.